I am experiencing something right now that so many of you do every year. However, it is brand new to me. I have a child attending public school, so this is my first "have them home all summer" thing. Normally, all of my kids are here all the time, and you just learn to pace yourself. I've written before that we needed to make some changes for everyone, and this was a great decision. No regrets. It is beneficial to the entire family. However ... summer. You have to acclimate to the constant again. It's showing me just how much I do this naturally with homeschooling, and just how well I got used to the "new normal" in our home. Thankfully, we are surviving with very few tears and I have yet to pull out all of my hair. Which is good, because mine would come out very quickly, seeing how most of it is stuck together. Thought I would share my gems that have made a huge difference for us. It's simple, really. I have also been practicing "yes!" a lot. If it's not going to hurt a person or a thing, I try to say yes. It is the summer of mess, but it is also the summer of peace and joy. It is the summer of creativity. It is the summer of removing polish and repainting nails four times a day. "Mom, I don't like how I painted my nails this morning. Can I paint them again?" I sat and thought and then let out a, "Yes!" I also helped them buy their very own polish remover, cotton balls, and makeup remover wipes with their allowance money. All theirs. No one else can hog them or use them up, and they can use them all day long if they want to. Put it on, take it off. Paint it on, take it off. Repeat, repeat, repeat. It is messy, but I created areas where the mess is fine and encouraged. Why, yes, their clothes are covered in stains. Permanent stains. Many on the butts of their britches. Uh-huh. Look at me all not caring! Just gonna' buy ALL new things before school starts again. Someone give me a ribbon! I was taught a lesson a year ago from a therapist who has issues with attention: kids with ADHD don't often feel overwhelmed, they actually tend to feel painfully bored to tears. 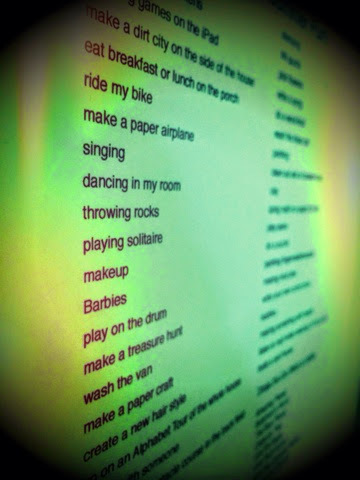 Out of all the things on the list, I'm seeing about the same six activities repeated most of the time. The choice gives feelings of control. The mess factor gives feelings of creativity and again with the control aspect. I made sure to put a little novelty in there, like "Eat a meal outside." Who knew? I've never once said you CAN'T eat outside. However, after putting it on that list, my kid has eaten breakfast and lunch out there almost every single day. Follow Christine's board Summer Fun List on Pinterest. This makes me feel better about the fact that my house is an ABOMINATION OF THE LORD right now. The kitchen is dirty, but, hey, the kids are preparing their own breakfast and lunch, what do you expect? And the basement is trashed because, oh yeah, every kid in my neighborhood has torn through it in the last week. And the living room is a dumping ground for our pool/park/picnic gear. But that's OK, because summer can be messy. What a concept. Letting go of having to be the mom who has it all together this summer. We currently have seven kids living with us (our four, two foster sisters, and a fresh air child) and four of them go to this amazing farm camp next week. The list states that the lunch-plus-two-snacks needs to be 'trash-free'. In addition, we are basically vegan and the camp is nut-free. I am all about tupperware, but SEVEN KIDS. I just packed 4 lunches and snacks, in 20 minutes not two hours. They are not trash-free. I feel ok about this. I just finished a three-day weekend with six kids alone, ending with three hours of detangling my daughter's amazing afro which was out and free for a few days too long. Everybody has clean clothes for tomorrow and everyone has had a bath/shower in the past couple days. Even the dog and guinea pig (and the neighbor's fish) were fed today. I can save the earth with tupperware next year...or maybe not if we have more kiddos who need our home...but that's ok. It really is. Can we see your list? I love the list idea. I too have one ADHD child at Public School this year and am experiencing "summer" for the first time. We spend as many hours at parks as possible so it's going okay. He functions much better not at home. This is a brilliant idea. I am totally going to do this now. Thanks so much for posting this idea. I know here in my house, my kids would love to feel more in control and this is just the way to do.